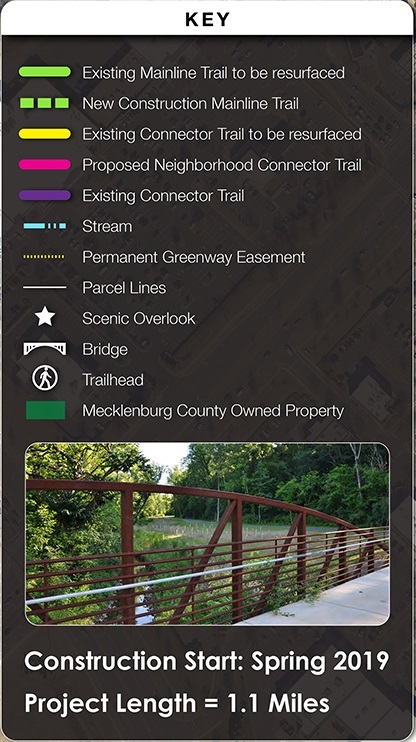 (September 15, 2018) Mecklenburg County Park and Recreation staff provided a map display showing the addition to the Walker Branch Greenway Trail at its Information Drop In Session on September 8. 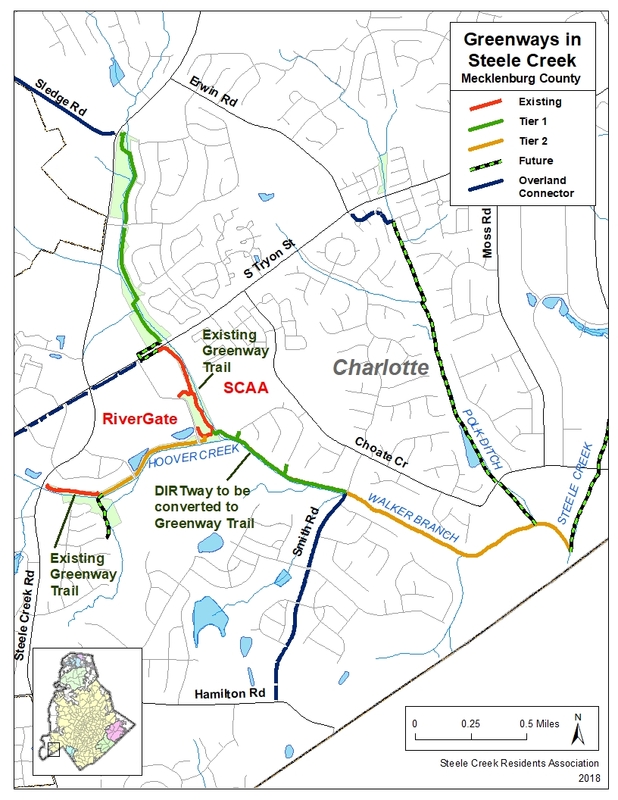 Mecklenburg County plans to extend the Walker Branch Greenway Trail from the south end of the current trail behind RiverGate Shopping Center to Smith Road and to resurface the current trail. The addition will more than double the length of the trail to just over one mile. 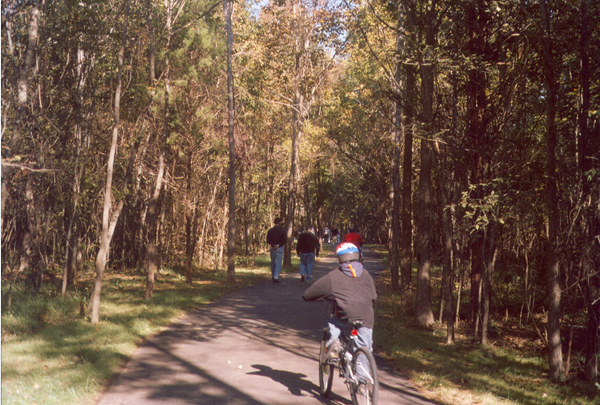 The path of the new greenway trail is currently accessible as a mowed dirt path, or DIRTway.. The DIRTway will be upgraded to a 10-foot wide asphalt trail with a bridge across Walker Branch. The trail extension will have one neighborhood connector trail to the Walkers Creek neighborhood at the west end of Walkers Creek Drive along a public easement. Another potential connector at the east end of Walkers Creek Drive contains obstructions and cannot be used as a connectoor. No public access property is available for a connector to the Southbridge neighborhood. Construction will begin in spring 2019 and be completed in fall 2019. The map below shows current and planned trails on the county's Master Greenway Plan for the area around Walker Branch. The existing Walker Branch Greenway Trail and the shorter trail along Hoover Creek were built by the developers of RiverGate. The extension of Walker Branch Trail to Smith Road will be the first greenway trail in Steele Creek built with Mecklenburg County tax dollars. The Steele Creek Greenways and Parks Committee of the Steele Creek Residents Association is working with developers and county staff to establish additional trails or DIRTways in the area. One opportunity is to establish a trail along Hoover Creek while construction is underway for new apartments on the south side of the creek. Another is to extend Walker Brianch Trail north to Highway 160 at Sledge Road and identify routes along roadways to connect to Winget Park. The Committee is collecting names and contact information of persons who support greenways in Steele Creek. One goal is to get at least one contact for each neighborhood (HOA or apartment complex) in the Walkers Branch/Hoover Creek area. If you would like to add your name to the list of supporters, please email the following information to communitytrail@steelecreekresidents.org.